If the shoe does not fit... you must acquit. Oh wait, that was something else. Dang, I'm disappointed to hear about the heel in your Saucony's. I was hoping to maybe give them a try and, I think Tammy would like them as well. Way to go on your 14. Don't sweat the distances past 12... they'll get better/easier in your training. They're like any other run too, sometimes they go well and sometimes they don't. You'll do just fine. Just take them easy. I'm stoked we'll be headin' up to GR for the Riverbank Runs. I think Tammy is going to register for the 5k and our friend Dianna is running the 25k. If I feel ok after the marathon and think I can tolerate it, I'll run the 25k as well. I'll be there regardless though. Yea! Hey, if you don't feel up to the 25k you could always take a crack at the new 10k distance. Today I made up for the crummy Saucony issues...I went to the nearest NB store (in GR) and picked up a pair of 903s (*LOVE*) and tried on a pair of 768s. Seems like the things that were causing me issues with my 767s have been corrected, so I bought a pair online for a good price (almost $20 cheaper than at the NB store, free shipping). I think most of my problems with the Saucony were due to my weird feet...short legs, cankles. I have had similar issues before--with a NB shoe. Anything that has a very high heel tab is bad news for me. Give it a try. Nice shoe, otherwise. Very soft, cushy. Thanks for the info on the Saucony's and clarification on your irregular feets. Tammy really needs cushy shoes so, these might do the trick for her. Back in the day, the ASICS Gel Nimbus, I think they were 7's or 8's, worked well for here, but they change the dang makeup of the shoes sometimes when they update the models and screw them up! Grrr. Have a great weekend! The weather is supposed to be slendid here. Another benefit of the 25k is that it is so large and social. 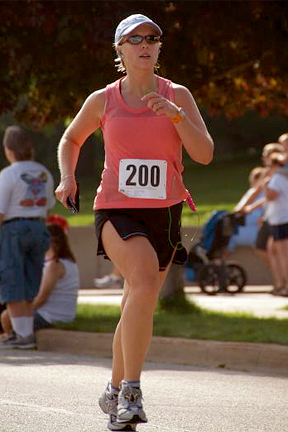 Last year I could have pushed myself harder, but there were so many nice folks to chat with and the weather was gorgeous--really killed my urge to crank out a hard race. Oh, hey, I was gonna ask you if you could add to your poll, couch to refrigerator? That's my absolute favorite. Sounds like a wonderful race... the 25k Riverrun that is.